You will be pleasantly surprised with our approach to commercial roof installation in Bradford, ON. There are a number of things that you should consider when deciding which contractor to trust with commercial roof installation for your property. Price is just one component of the decision. Integrity, experience, warranty and workmanship are all very valid considerations, as well. At Slippery Slope Roofing, we believe you will be pleasantly surprised with our approach to commercial roof installation. Integrity – We have worked diligently to build and preserve a fine reputation in Bradford, ON. We have done that through integrity and keeping our customers’ needs first. You can be assured that your commercial roof installation project will be completed on time and to your 100% satisfaction. Experience – Our owner and foreman have 50 years of combined experience in the industry. We know everything there is to know about commercial roof installation, including how to put you first by completing your job before moving on to the next. We do not juggle jobs, so we can give complete attention to you. Warranty – We perform our commercial roof installation under the exacting guidelines of the shingle roof manufacturers to safeguard the warranty they offer. We also include a 10-year warranty on our workmanship to give you peace of mind that your roof will be trouble-free for years to come. Workmanship – You just won’t find a more dedicated workforce than our commercial roof installation team. We not only have an unprecedented attention to detail to assure you the best results, but we do so in a clean and tidy manner to reduce the disruption to your business. When you are ready for expert commercial roof installation by a company with integrity, experience, a warranty and quality workmanship, give us a call. 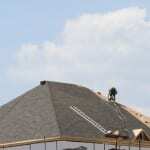 We’ll be glad to provide you with a free estimate for commercial roof installation at your convenience. At Slippery Slope Roofing, we offer high-quality commercial roof installation services in Bradford, Barrie, Orillia, Alliston, Newmarket, Midhurst, Cookstown, Beeton, Innisfil, Angus, Collingwood, Wasaga Beach, Oro-Medonte, Midland, New Tecumseth, Clearview, Bradford, Essa, Stayner, Springwater, and surrounding areas of Ontario.